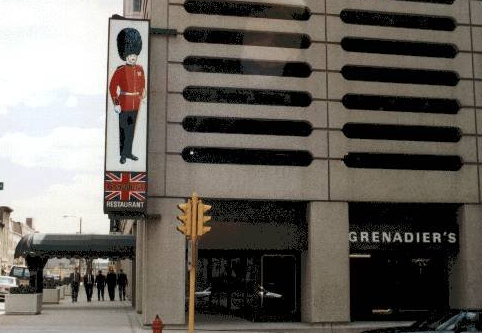 Milwaukee’s Grenadier’s Restaurant hosted presidents and, throughout its 29 years, stood out not only in Milwaukee, but also competed with Chicago’s finest restaurants. In 1978, the Chicago Tribune wrote, “With all its fine dining rooms, Chicago has nothing, except perhaps for its exlusive private clubs, quite like Milwaukee’s Grenadier’s Restaurant.” The Grenadier Restaurant was my dad’s favorite place to dine. It was very British and very formal and fine dining at its best. Coat and tie a must. It has been missed since its closing. Knut Apitz, Grenadier’s chef and owner, hosted President George H. W. Bush in 1989. The following dish was “my own concoction,” Chef Apitz said. “with lightly sautéed veal medallions, fresh crayfish tails, and a very light crayfish sauce and a hint of hollandaise sauce.” The President was also served a floating island with fresh raspberries and terrine of duck. The recipe for the Presidential dish was provided to the Milwaukee Sentinel and the original article can be found http://news.google.com/newspapers?nid=1368&dat=19890216&id=s35QAAAAIBAJ&sjid=qhIEAAAAIBAJ&pg=3334,4398583. This wild duck recipe was provided by Grenadier’s Executive Chef Charles Weber to the Chicago Tribune in 1998 and Abby Mandel’s original article can be found http://articles.chicagotribune.com/1998-04-12/news/9804120310_1_duck-breasts-tablespoon-kosher-salt-tart-cherry-sauce. Weber grew up in Wisconsin and blended his knowledge of hunting with his art of cooking. The Grenadier Restaurant provided this recipe to the Milwaukee Sentinel in 1982. The chef noted that this soup can be prepared with pork shanks, pork knuckles or sausage to make it a main course. Grenadier’s Executive Chef Charles Weber’s Grilled Quail recipe was provided to the Chicago Tribune in 1998 and Abby Mandel’s original article can be found http://articles.chicagotribune.com/1998-04-12/news/9804120310_1_duck-breasts-tablespoon-kosher-salt-tart-cherry-sauce. Byerly’s, an upscale grocer in Minneapolis, is renown for great recipes. Back in 1992, the store copyrighted this twist on the traditional artichoke dip recipe and advertised it to customers on give away recipe cards. It can be made ahead for parties, but, you are pressed for time, Byerly’s offers a great spinach artichoke dip in it’s delicatessen. (Or…if you prefer spinach to jalapeño, just substitute!) Serve with crispy crostini or sliced, toated French bread. A pretty simple, always delicious recipe for a cold Saturday night. The trick is in the beauty of the creamy sweet Wisconsin Russet Potato. This russet produces lovely, crispy fries that are soft inside and taste even better when watching high school hockey state tournaments! Preheat oven to 450 degrees F. Scrub the potatoes clean with steel wool. Cut in wedges about 1/4 inch thick and place into mixing bowl. Melt butter and pour to taste over cut potatoes, add salt, pepper, garlic powder, paprika and onion powder to taste and toss well. Spread sparingly on large ungreased sheet pans (may use parchment paper) and place in hot oven. Let potatoes roast for 30-45 min., or until the bottom of the potatoes brown. Turn potatoes and contue roasting until crisp on the outside, and soft inside. Serve. This great Italian recipe comes to us from a famous New York restauranteer, “Mother Leone.” The introduction to Luisa Leone came through a well-worn copy of her son Gene’s 1967 cookbook, perched high on a bookshelf in a dusty antique store in northern Wisconsin. The teal cover, missing its dust jacket, protected old, authentic recipes, the kind that pass from one generation to the next. Leone’s was a New York institution, now gone, but still very much missed. Luisa Leone entered the restaurant business in 1905, her son Gene writes in the introduction. Just a year earlier, she was only dreaming about running a restaurant. That changed the night Leone’s husband Geralomo invited fifty members of the Metropolitan Opera to their home for Luisa’s birthday, including the great opera tenor Enrico Caruso. Caruso, himself, encouraged her to make the restaurant a reality and convinced Geralomo to agree. Luisa’s resaurant began in her converted living room, then grew to twenty seats, and then to a larger space, then an even larger space in the heart of New York’s theatrical district on West 48th Street, and to eventually to fill two buildings and seat 1,500 guests, serve more than 6,000 dinners on busy evenings. Leone’s had become a multi-million dollar affair that catered to the famous, including W.C.. Fields, George M. Cohan, Presidents Truman and Eisenhower (who wrote a forward for the book). After Luisa died in 1944, her sons continued the business. Later, one son, Gene took over with his wife. The place became a New York staple, serving Luisa’s cooking far into the early 1990s. Sadly the restaurant closed, but the recipes, of course, live on. Here’s Leone’s Pork Chops with Spaghetti, except substituted inch-thick sliced pork loin for Luisa’s pork chops and served her sauce and pork over her wonderful polenta instead of pasra. Combine oil and half the butter in a large heavy-bottomed skillet and heat garlic black and red pepper 2 min. Sprinkle pork with rosemary and brown in the pan, 5 min. per side. Lower heat to medium, add tomatoes, salt and parsley. Cover and simmer 20 min. Uncover and simmer 20 min. more, until pork is done and tender. Taste for salt. While cooking prepare spaghetti as in the original recipe, or try the polenta below. Soak the cornmeal in the cold water. Stir it into the boiling water, add salt and butter. Stir constantly and simmer 20 min. to a creamy consistancy. Taste, add salt if needed. Once polenta is cooked, spread it on a warm plate, sprinkle with a little cheese and arrange the cooked pork and sauce on the polenta, sprinkle with cheese and serve.